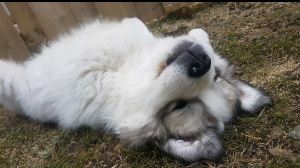 We are the proud Human parents to a soon to be 5 month old Pyrenees. We got her at 8 weeks old and are madly in love with her. One thing we have noticed is she licks, a lot. The walls, floor, people, anything and everything. Is this something this breed does or should we be concerned? She has been to the vet on a regular basis since we brought her home and is in perfect health, she is crate trained and just graduated from Puppy Socialization Level 1 class. Maybe she misses her mommy. Could you make some sort of frozen yogurt treat in a Dixie cup? For summer months take an ice cube tray fill it with chicken broth and put apple wedge in it. Freeze and serve! Have had 15 dogs in 38 years and 2 were Pyrenees, none ever did that but could be some quirky habit and she may outgrow it. I don't think it has anything to do with the breed. My Pyr, Brutus, is 9 1/2 yrs old. He absolutely will NOT lick anyone or anything but himself. I've never even been able to get him to give me a kiss. He loves to be petted but won't lick or jump on anyone or anything. Since your fur baby is jut a puppy, she will probably grow out of it with a little persistent training not to do so.